The engraved border of this scroll was designed by the Italian author, artist, and publisher Francesco Griselini (1717–1787). A man of broad intellectual pursuits, his interests ranged from botany and agri- culture to cartography, politics, drama, and the arts. In the late 1730s and 1740s he produced several works of Judaica, including four frontispieces for a Hebrew Bible published in Venice 1739 (cat. no. 44), an engraved wall decoration for a Sukkah, and most notably, this illustrated scroll border. The border design is composed of an arcade featuring four distinctly patterned columns. The arches are surmounted by a balustrade that supports flower- ing urns, blank medallions, floral scrollwork, and a variety of birds including a crowned double-headed eagle and a peacock. Scenes from the Esther narrative are positioned beneath each of the nineteen columns of text. In these illustrations, Griselini has devoted particular attention to architectural settings and spatial perspective. The artist’s printed sig- nature is found in the lower left corner of each membrane. This engraved border design was popular in Italy in the eighteenth century as demonstrated by two similar scrolls in the Braginsky Collection: an unsigned scroll of superior artistic quality (Braginsky Collection Megillah 11) and a small megillah with a related design (cat. no. 100). One of the most striking images in this group of scrolls is the last illustration, placed under the final arch, where the concluding benedictions usually are written. It depicts the Messiah heralding the return of the exiled Jewish people back to the walled city of Jerusalem. This representation of messianic redemption, not commonly found in decorated megillot, is intended to elucidate the final blessing, which appeals to God to bring salvation. 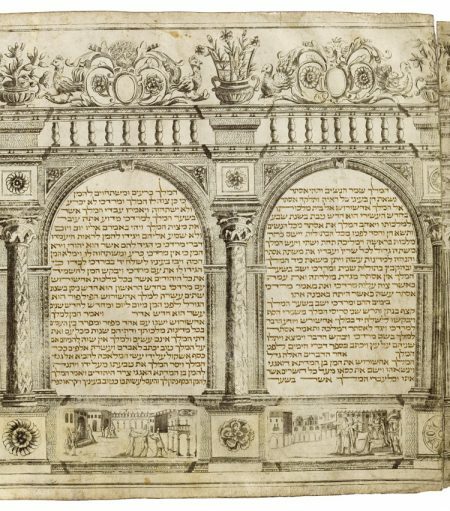 The image is copied directly from a Haggadah first printed in Venice in 1609, and reprinted many times over the next two centuries. 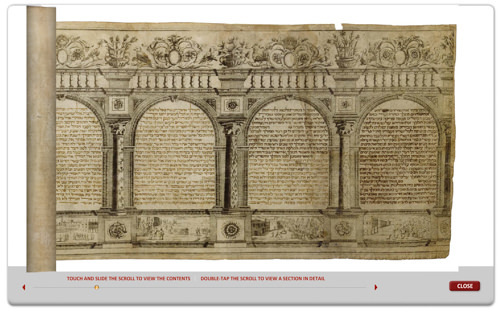 The text of this Griselini scroll was penned by the accomplished scribe-artist Aryeh Leib ben Daniel (cat. no. 86). In his inscription, which follows the concluding benedictions, he informs the reader that he wrote this scroll in Venice in the winter of 1746. Kaniel 1979, p. 108; Metzger 1966, pp. 381–432; Sabar 1997/8, pp. 294–312.